Davits – Summit Anchor Co.
to clear non-load bearing parapets or other architectural features (such as glass or other finished parapets, decorative railings, cornices, overhangs, or sloped glazing) of a building that may be easily damaged. Davit base pedestals are permanently mounted directly above suspension locations. Portable davit arms are moved manually to each location when needed. The mast and boom components of the davit arms may be dismantled for easy transportation. Each maintenance worker’s lifeline should be attached to an independent anchorage on the roof. Davits can be used alone or in pairs. 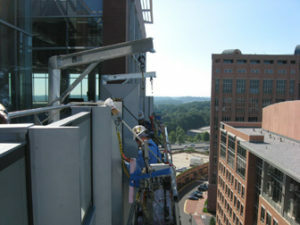 Davits may be used singly when supporting one-man rope descents or a single-point suspension scaffold. Davits are used in pairs when they will be used to suspend a powered platform with hoists mounted at each end. Davits can be ground-rigged or roof-rigged. Ground-rigged davits provide an anchorage point for suspending a platform situated on a lower level (e.g. sidewalk or street below). Roof-rigged davits enable workers to initially rig and board a powered platform on the roof, which will then be launched outboard over the parapet and suspended along the building face. All our davit components are completely hot-dipped galvanized after fabrication to resist corrosion. Our davits have been engineered and tested to comply with current OSHA and ANSI I.14.1 safety standards for fall arrest and suspended maintenance. Davit bases can also be recessed on areas such as terraces where a clean appearance is desired over noticeable penetrations. The davit mast can rotate 360º and has an adjustable suspension point that can be located along the davit boom for best positioning of the platform. Davit arms can be configured for a maximum outreach of 8′-6”.